Family-owned and operated since 1985, Ferrari-Carano has been a leading producer of world-class, nationally acclaimed wines. From a small, 30-acre plot of grapes to the present 20 estate vineyards, Don and Rhonda Carano's success is based on their commitment to quality as well as the dedication of the vineyard and winemaking teams to make the finest wines, vintage after vintage. Ferrari-Carano owns vineyards in six appellations: Dry Creek Valley, Alexander Valley, Russian River Valley, Napa/Carneros, Anderson Valley and Mendocino Ridge. The fact that the winery's name incorporates the word "Vineyards" is a deliberate way to empha-size that grape source and terroir play important roles in the final product. 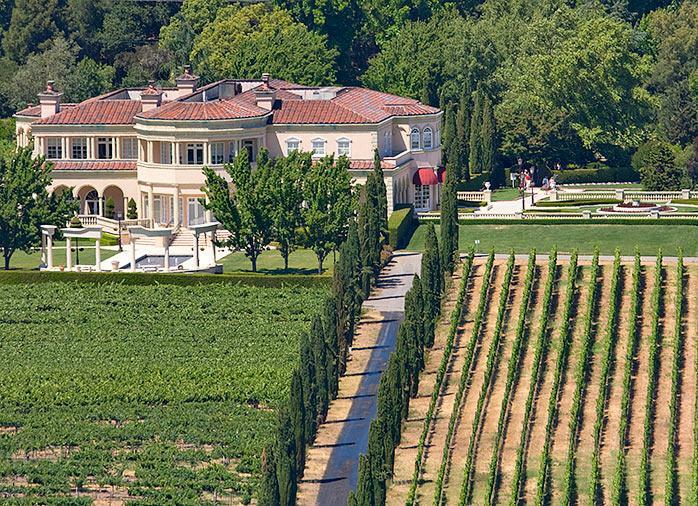 From a small, 30-acre plot of grapes purchased in 1979, to today's 19 estate vineyards in six different appellations totaling over 1,500 acres, Ferrari-Carano owns some of the finest wine growing properties in all of California. Directed by Don Carano and orchestrated under the supervision of Steve Domenichelli, Director of Vineyard Operations, Ferrari-Carano's vineyard practices are extremely labor intensive. Steve and his team implement irrigation and nutrient regimes, trellis system and canopy management, rootstock and clone combinations, and pruning and cane selection for each vineyard site and each block within a vineyard. Because of Sonoma, Napa/Carneros and Mendocino County's diverse geological makeup, even within one vineyard parcel there may be several different types of soil with different degrees of nutrients for vines and water-holding capacity. Steve and his team have long practiced sustainable farming techniques, such as recycling organic matter for use as mulch in the vineyards, planting cover crops and other plant species to avoid soil erosion and to add desirable nutrients back to the soil as well as attract desirable insects, and integrating animals to naturally enhance biodiversity and nutrient recycling. This wine has delicious aromas and flavors of white peach, honeyed citrus, kiwi-lime, lychee, orange blossom, apricots and Meyer lemon. Full-bodied and bright at the same time, this Pinot Grigio’s concentrated aromas, flavors and refreshing acidity linger to the finish. Wine Spectator 93"Strikes a fine balance between vibrant citrus and green apple and pear notes, lightly oaky, with a creamy midpalate, so deftly elegant and refined that it’s hard not to take a second or third sip. Drink now through 2022"
Wine Spectator 90"An eclectic blend, with a zesty sense of style, offering compelling raspberry, smoky anise and spice flavors that have a snappy finish. Sangiovese, Malbec, Petite Sirah and Cabernet Sauvignon. Drink now through 2024."